SINGAPORE: The Ministry of Health (MOH), Health Promotion Board (HPB) and Health Sciences Authority (HSA) will be holding a public consultation to seek views from the public from Jun 25 to Jul 24, 2015 on proposed amendments to the Tobacco (Control of Advertisements and Sale) Act (TCASA), MOH announced in a media release on Thursday (Jun 25). The Tobacco (Control of Advertisements and Sale) Act prohibits advertisements, promotions and sponsorships relating to tobacco products and their use, controls the use of tobacco products by young persons, as well as regulates the sale, packaging and trade description of tobacco products, according to MOH. Under the proposed ban, tobacco retailers will be required to keep tobacco products out of patrons’ direct line of sight, in permanent, self-closing and opaque storage units within their stores. Penalties such as fines, will be imposed if retailers do not comply with the requirements in the regulations. The POSD ban aims to reduce exposure of non-smokers to tobacco products. It also aims to reduce impulse purchases of tobacco products, which may help smokers who are trying to stub out their smoking habits. The Act will be amended to allow tobacco retailers to show text-only price lists of tobacco products to customers upon request. This is so customers will not need to request to view the tobacco products within the storage units for an extended period of time, reducing the period which other customers are exposed to tobacco. Additionally, Section 13 of the Act will be amended to allow the Government to standardize and prescribe specifications for the visual characteristics of “No Sale to Minors” signage used by retailers. A number of administrative and technical amendments are proposed to streamline operational and enforcements aspects of the Act, to update the Act for better control of imitation tobacco products and tobacco promotions, advertisements and sponsorship, and to fine-tune the existing law. MOH previously sought feedback on the above measures through a public consultation in Jun 2013, it said. 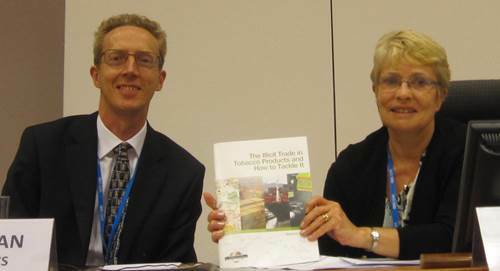 Trade engagement sessions with tobacco retailers were also conducted in November 2014, to address their potential concerns with the introduction of the POSD ban. The Tobacco (Control of Advertisement and Sale) Act will be amended after the public consultation and engagement sessions, according to the release. The public can submit feedback on the proposed amendments to the Act using this form online. All feedback should reach MOH by 5pm on Jul 24. For the fourth consecutive year, ITIC developed an excise-related module for the World Customs Organization as part of its’ annual two week Knowledge Academy. The Knowledge Academy provides customs officials from around the world with an opportunity to learn about the latest trends and good practice in a range of different customs related issues as part of their continuous professional development. ITIC Program Advisor, Liz Allen, put together a two-day module on excisable products and illicit trade with the assistance of the WCO, who provided some of the speakers. Other speakers were drawn from ITIC industry sponsors in excisable products, Spirits Europe, Euromonitor International and Interpol. Knowledge Academy delegates are able to attend a number of different modules according to subjects that are of interest to them. Consequently, the numbers present for the different sessions varied over the two days. The class list included delegates from Ireland, Australia, Malaysia, Sri Lanka, DR Congo, Ethiopia, Cuba, Cameroon, Cote d’Ivoire, and Angola. Participants included Directors and Deputy Directors-General of Customs and Revenue Authorities, two private sector delegates and a representative from the World Health Organization. All presentations commissioned by ITIC will be available on the ITIC website and the full range of presentations will be available to WCO members on their members only website. Hong Kong (HKSAR) – Hong Kong Customs detected a suspected case of using fake dip soldering devices to conceal illicit cigarettes today (June 25) at Lok Ma Chau Control Point. About 800 000 sticks of suspected illicit cigarettes were seized on an incoming lorry. The total market value of the cigarettes was about $2.2 million with a duty potential of about $1.5 million. In the operation, a 45-year-old male driver was arrested and the lorry used in the suspected smuggling of illicit cigarettes was seized. Customs officers at Lok Ma Chau Control Point this morning intercepted an incoming lorry declared to be carrying a batch of express cargo. After thorough inspection, Customs officers found about 800 000 sticks of suspected illicit cigarettes inside 58 fake dip soldering devices. It was believed that speedy distribution of the illicit cigarettes to various buyers in the territory would be arranged. Members of the public are urged to report suspected illicit cigarette activities by calling the Customs 24-hour hotline 2545 6182. President Obama and U.S. Trade Representative Ambassador Froman have the opportunity to curb the tobacco epidemic forever. The Senate voted to pass the Trade Promotion Authority Bill (TPA or Fast-Track) which creates an expedited process to get trade bills through Congress, paving the way for Obama’s signature. ASH Executive Director Laurent Huber says “The TPP is a moment in history for Obama – he is making a choice about how to treat tobacco that will echo for decades to come. The New Zealand Government’s Customs Minister Nicky Wagner claims that the country’s customs service has destroyed more than 2.5 tonnes of ‘abandoned tobacco’ and collected NZ$1.35m ($933,324) in additional duty and taxes since it reduced the duty free tobacco allowance last November. “The change was well signalled in advance and advertising to highlight the change continues. Customs’ passenger surveys show most people are aware of and accept the change in regulations. Associate Health Minister Peseta Sam Lotu-Iiga also welcomed the reduction in the amount of tobacco being brought into New Zealand through its airports. “The fact that people appear to be aware of the changes to our duty free tobacco limits and accept them is confirmation that our Government’s policies are making a real difference. We are determined to reduce the harm tobacco causes and the cost to our health system. “The new duty-free tobacco limits, together with tax increases on tobacco sold in New Zealand, are pricing tobacco out of reach of many users. This is reflected in the numbers of smokers giving up tobacco,” he said. New Zealand changed its regulations on 1 November, 2014 where passengers have had to declare any tobacco over the 50 cigarettes or 50 grams, and either dispose of the excess or pay duty on it. Tobacco sent by mail or cargo also no longer qualifies for a gift allowance.